Kyana is a 6 year old Kindergartner at WK School in Winona, MN. She loves school, especially music and art class. She loves dancing and is currently a student at SG Danceworkz where she does ballet, tap, jazz, and hip hop. 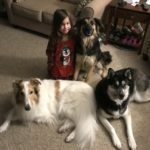 In her free time, she likes to play with her dogs Casper, Wolfgang, and Zayda. She enjoys playing with her cousins Nora and Essie as well. Jumping on the trampoline, reading, making up songs and dances, and sharing and caring are what Kyana does and loves to do best.